Recovery Café’s journey began over 30 years ago in Washington, DC. In 1985, Killian Noe, Recovery Café’s Founding Director, and David Erickson founded Samaritan Inns, an effective and comprehensive response to homelessness and addiction. In 1999, Killian moved with her husband and two children to Seattle. Eager to learn about the needs of Seattle’s people and how the city responds to those needs, Killian visited a wide variety of non-profit agencies in Seattle. She saw how shelters, transitional housing, and supportive housing programs often lacked the funding or expertise to provide adequate recovery support for those individuals. Killian, along with Randall Mullins, started the New Creation Community, an ecumenical faith community committed to contemplation and action and to standing in the ever-widening gap between the world’s rich and poor. At this time, she also recognized a need for adequate recovery support for those individuals traumatized by homelessness, addiction, and other mental health challenges and began to share this unmet need with others. New Creation Community members Ruby Takushi (a respected psychologist), Mary Crow (with over 25 years’ experience in recovery work), and Cecilia McKean (a nurse and counselor) stepped forward and began meeting weekly to pray, dream, and envision a response to this need. Others from New Creation Community gave their support, and a generous visionary, Emmy Neilson, was the first to invest financially in the dream. In 2003, Recovery Café was founded as a direct response to the critical, unmet need for those who suffer on the margins – that of long-term recovery support. 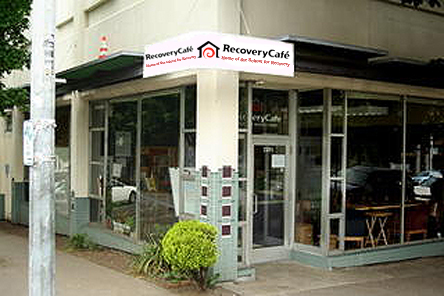 In January 2004, after a long search for a space and a substantial renovation, Recovery Café opened its doors in the Belltown neighborhood of Seattle. At the time, no organization was offering this fundamental service to break the cycle of destruction and despair for the individuals who have suffered trauma, homelessness, addiction and/or other mental health challenges. Recovery Café provided a space to serve those individuals who needed an on-going supportive community in order to stabilize and maintain stability in mental health, relationships, housing and employment. The unique program quickly became recognized, and in 2008, the Café received the End Hunger Mayor’s Award for commitment to feeding and supporting the Seattle community. With nearly 70% of the people living in Seattle’s shelters and transitional housing struggling with addiction as well as other mental health challenges, the needs grew to exceed the capacity of the existing space. The Café moved into a new, permanent home in the Denny Triangle neighborhood in 2010. Relocating to a space nearly four times larger enabled the Café and its School for Recovery to expand and enhance programming and services beyond what was possible in the original location. In 2012, Recovery Café won the Award for Innovation in Community Engagement and was recognized as an excellent example of how a Recovery Oriented System of Care (ROSC) works by experts from Washington State and King County studying the effectiveness community treatment models. And, in 2013, the Café was the recipient of the Family Advocacy Award from the Washington Association for Marriage and Family Therapy. In 2014, we celebrated 10 years of transformative and healing work, and concluded a successful capital campaign. Additionally, in partnership with Washington State and King County, Recovery Café hosted the initial launch of the Washington Recovery Alliance, a statewide coalition formed to create a unified voice for recovery services in Olympia and advocate for systematic change. Today, our nationally-recognized model centered on evidence-based best practices continues to break down the structures and systems that marginalize some of the most vulnerable people in our community. Although the programming and services offered at the Café has grown exponentially over the years, our mission remains steadfast – to be a part of ending the cycle of suffering, addiction and despair that has afflicted so many in our community and facilitate their healing and transformation to a life of stability, sobriety and service. As we look to the future, we dream of Recovery Café’s in every community across the United States struggling with addiction. To date, Recovery Café has helped groups in San Jose, CA and Everett, WA begin their own Recovery Café to respond to the needs in those cities.